Like many of the well-known supermarket apple varieties, Granny Smith is undergoing something of a renaissance as apple enthusiasts discover that the qualities that have made it so successful as a commercial apple can also be useful in the home orchard. The flavour of home-grown examples can be more complex and interesting than the one-dimensional tart acidity of shop-bought apples, particularly if you allow the apples to ripen fully on the tree. As well as the distinctive green skin and tart flavour, Granny Smith is well known for its excellent keeping qualities. It is one of the best apples for home storage. Please fill in the details below and we will let you know when Granny Smith apple trees are back in stock. Granny Smith is in flowering group 3. Granny Smith is self-fertile and does not need a pollination partner, although fruiting may be improved if there is a compatible tree of a different variety nearby. Since it flowers in the middle of the blossom season it can be pollinated by most other apple trees. 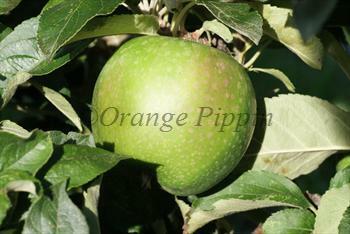 Granny Smith will grow happily in the UK, but requires a warm summer and a sunny autumn for the apples to fully ripen. It is therefore best grown in full sun in a very sheltered south-facing spot, and is probably most suited to the south and east of the UK. Granny Smith is generally easy to grow, but it can lapse into biennial bearing if allowed to over-crop. Cropping is usually very good but the famous bright green color is only achieved in areas of warm days and nights. In cooler climates where autumn temperatures drop overnight Granny Smith can develop an attractive red flush. One of the unusual features of Granny Smith is that the apples tend to grow behind the foliage, on the inside rather than the outside of the tree - as can be seen in our main photo. Granny Smith is a very good pollinator of other apple varieties, making it an excellent choice if you are establishing a small orchard in a warmer area.